Aster Paeony Duchess Coral Callistephus Chinensis is a popular annual garden flower that belongs to the aster family. This magnificent plant produces 5 to 8 sturdy floral stems that are topped with enormous, coral-rose in color, fully double, peony-like flowers. Aster Duchess blooms from summer to fall and adds unique delicate color to a garden. The fragrant aster flowers attract myriads of birds, bees and butterflies. Aster Paeony Duchess Coral is an ideal plant for cutting gardens. It is also widely grown in containers, borders and flower beds. The Callistephus Chinensis is drought tolerant and heat resistant. 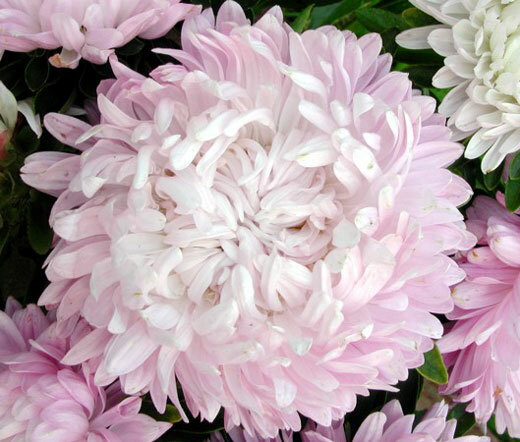 The China Aster grows best in full sun, but it can tolerate partial shade, and rich, well-drained soil is very beneficial for growing this annual. Aster Duchess Coral is highly prized for its long slender stems which makes it a perfect cut flower.